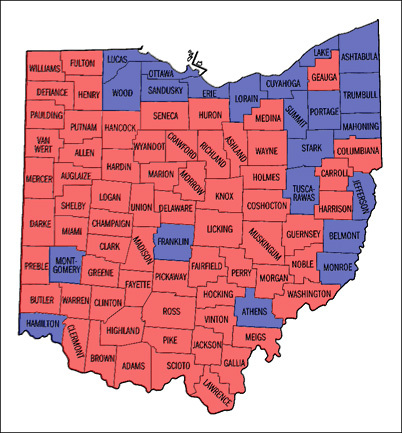 The political landscape that the presidential campaigns encountered in Ohio in 2008 represented a marked shift from 2004. In 2004 Republicans had controlled the governorship (Bob Taft), 12 of 18 U.S. House seats, both U.S. Senate seats, both houses of the General Assembly, and of course the Secretary of State's office (Ken Blackwell). The elections of 2006 (1) paved the way for Democratic success in 2008. Rep. Ted Strickland (D) won the governorship, Rep. Sherrod Brown (D) defeated Sen. Mike DeWine (R), Democrats picked up one U.S. House seat, they achieved gains in the state legislature, and Jennifer Brunner (D) was elected Secretary of State. Ohio's March 4, 2008 primary was a critical contest in the race for the Democratic nomination. It was seen as a make-or-break state for Sen. Clinton after a difficult February for her campaign. Clinton had a key support in Gov. Strickland. She went on to win the primary, defeating Sen. Obama by a bit more than 200,000 votes (8.65 percentage points) and her campaign was able to continue. Meanwhile the Republican race had all but been decided in favor of Sen. McCain. More than twice as many Democrats as Republicans turned out for the primary (2,386,945 to 1,136,668). Ohio is a major manufacturing state (third in the nation in manufacturing GDP), so the ongoing loss of manufacturing jobs was an central issue. According to the Census Bureau six of the state's eight biggest cities have experienced steady population losses between 2000 and 2007. Cleveland, Toledo, Akron, Dayton, Canton and Youngstown have all lost population, while Columbus has grown and Cincinnati has remained relatively stable. In May 2008 DHL announced a restructuring, putting thousands of jobs at its facility in Wilmington (Clinton County in Southwest Ohio) at risk. McCain held a closed meeting in Wilmington on August 7 to discuss the matter with officials. 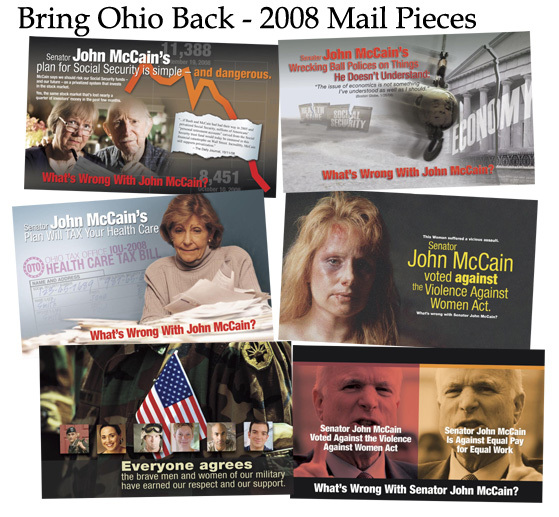 The Obama campaign put out a couple of very sharp ads pointing out McCain's involvement with DHL (1,2). Palin also rallied in Wilmington on October 9. (McCain carried the county by a solid margin 64.3% to 33.9% of the 19,305 votes cast). Ohio probably saw more travel by the four principals than any other state (Pennsylvania was close but saw a bit less travel by the Democrats). There were a number of noteworthy appearances. McCain announced his selection of Gov. Palin at a rally in Dayton on August 29. Obama did his debate prep. for the final debate at Maumee Bay State Park Lodge in the Toledo area. It was during that visit, on October 12, while doing door-to-door canvassing on Shrewsbury Street in the Lincoln Green area of Holland that Obama had his encounter with plumber Samuel Joe Wurzelbacher, who went on to become a Republican folk hero. Both Palin and Sen. Biden put a lot of time in the state; Palin visited the state six times in October alone while Biden did a couple of two-day bus tours and shadowed some of the Republican candidates' visits. The Wisconsin Advertising Project found that the McCain and Obama campaigns each spent more money advertising in Ohio than in any other state from Sept. 28-Oct. 4 (Obama $2.2 million and McCain $1.7 million). For the period from Oct. 21-28 Ohio had fallen to fourth for the Obama campaign ($2.0 million) and third for the McCain campaign ($753,000; but this was supplemented by $999,000 in RNC advertising). The Cleveland market was sixth in the country in total airings of candidate, party, group and coordinated ads from Sept. 28-Oct. 4 and eighth in the country from Oct. 21-28. As in other states the unprecedented Obama field organization was a key factor. The Ohio Democratic Party memo "Historic Democratic Victories in Ohio and How We Did It" outlines some of the numbers. The ODP and Obama's Campaign for Change reported registering 105,862 new Ohio voters during this cycle. For the general election Democrats claimed a registration advantage of 986,495, "the highest in a generation." (In the eight months between the primary and the general election, overall voter registration increased by 461,185). The Democrats further reported 60,000 volunteers, 700 people hired, 8.7 million flyers or packets of information delivered, and more than 3.5 million phone or at the door conversations completed. In a post-election news conference, Laura Quinn, CEO of Catalist, which provided data to 90 progressive organizations and campaigns around the country during the cycle, described "a huge paradigm shift from 2004" in Democrats' and progressive organizations' use of data for voter contacts. Catalist reported that, "A detailed analysis of the implementation of targeting in Ohio in 2008 showed a dramatic shift in the focus of voter contact programs away from repeated contact directed at voters who were already likely to be Democratic, and toward voters who were less likely to be solidly Democratic but highly likely to turnout and toward voters who were highly likely to be Democratic but much less likely to turnout." Jon Seaton, McCain-Palin regional campaign manager for Ohio and Pennsylvania, observed, "As Election Day got closer, we did feel that we were starting to gain the momentum that we lost following the financial meltdown in mid-September, 2008. Our field offices were buzzing with activity, our events were energetic and well-attended, and both Senator McCain and Governor Palin spent a significant amount of time in both of our states, rallying the troops. While we of course made some mistakes, we are proud of the campaign that we ran and proud that, despite overwhelmingly difficult odds, our small staff and thousands of volunteers did not let up until the final votes were cast on Election Day." Ohio likely saw more independent activity by various groups than any other state. America Votes, the coalition of progressive groups operating in 14 states, was particularly well organized in Ohio. State director Scott Nunnery had started in 2004 and continued to build the coalition through 2006 and 2008. Nunnery noted several challenges faced by independent groups in 2008. "The protracted primary made it really difficult to plan," he said, and "the appeal and popularity of the Obama campaign made it difficult for groups to recruit volunteers." All told 78 local, state and national groups participated in the America Votes "table" in Ohio in 2008, including 46 core participants. America Votes had 20 staff and six offices and reported its coalition partners made 10.7 million contacts (>) and spent more than $45 million (this figure does not include broadcast media, but does take into account the fact the America Votes partners worked the entire ballot, including, for example, a successful independent coordinated campaign that focused on state House races). Working America, the community affiliate of the AFL-CIO, was likewise active on the ground. On a more modest scale, Vote Today Ohio, a PAC which raised money through ActBlue, rented vans and shuttled voters from college campuses and urban areas to early voting centers (>). FRC Action PAC (eight Ohio newspapers - Nov. 3, 2008). "The 2006 and 2008 election results were, in part, a direct response to the lack of commitment by conservative politicians to conservative policies, both fiscal and social. Lack of energy, focus and a timid spirit on the part of elected officials were critical issues leading to these election results." Interest groups on both sides of the spectrum did invest significant amounts in paid media. A majority of groups running TV ads about the presidential race put at least some of their money into the state (>). Conservative groups running ads in Ohio included: American Issues Project, BornAliveTruth.org, Committee for Truth in Politics, Judicial Confirmation Network, Let Freedom Ring, National Republican Trust PAC, National Rifle Association-PVF, Republican Jewish Coalition, and Vets for Freedom. 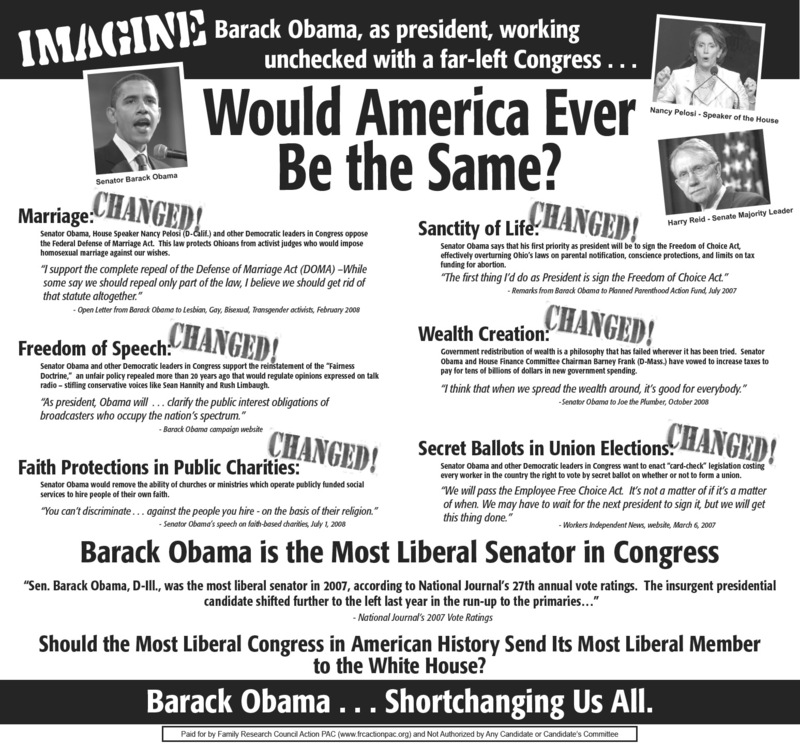 On the progressive side at least 16 different groups ran ads. 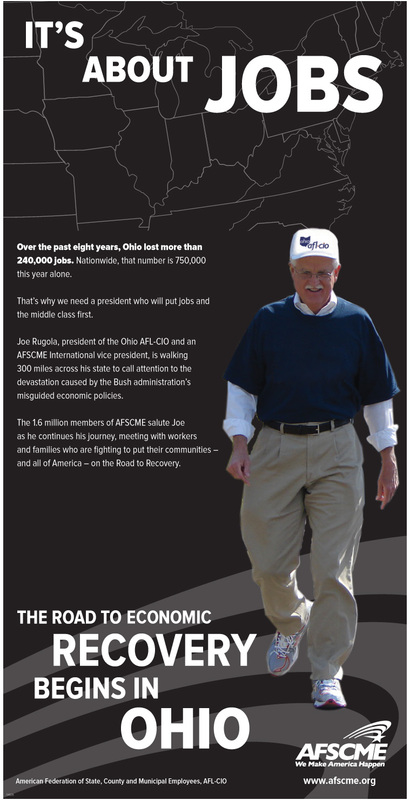 Bring Ohio Back (BOB), a 527 group, attracted notice with its "Dave and Joe" ads, based on two guys talking in a bar; BOB also did a lot of direct mail (>). Another interesting progressive advertising campaign was TruthandHope.org PAC, which filmed and ran several of its "Local Voices" ads in the Columbus area. In 2004 the conduct of Secretary of State Ken Blackwell prompted deep suspicions among Democrats and progressives, and they remained very sensitive to any prospect of voter suppression (>). In 2008, with a Democratic Secretary of State, the tables were reversed. Republicans questioned Secretary Brunner's motives and a number of her directives (she issued over one hundred on all manner of subjects during the course of the year). "She is actively working to conceal fraudulent activity and that puts the integrity of our election at risk," stated Kevin DeWine, deputy chairman of the Ohio Republican Party, in a video that appeared on the party's fightohiofraud.com website. The 2008 elections were the first time Ohio has used no excuse early and absentee voting. Republicans were particularly concerned about the potential for fraud during "Golden Week," the period from Sept. 30-Oct. 6 when there was overlap in registration and in-person absentee voting (>). On Sept. 26, 2008 the state party sued the Secretary of State over this and over more than 200,000 newly registered voters whose information did not match state records, a violation of the Help America Vote Act of 2002. (Republican Party of Ohio v. Brunner) On the voter match question, the district court and the U.S. Court of Appeals for the Sixth Circuit approved a temporary restraining order, and the matter went to the U.S. Supreme Court. As decribed in a Brennan Center for Justice analysis by Wendy Weiser and Margaret Chen, "On emergency review, the U.S. Supreme Court vacated the TRO [temporary restraining order] on October 17, 2008, preventing chaos in the election in Ohio and protecting hundreds of thousands of Ohio citizens from disenfranchisement-by-typo." House Minority Leader John Boehner, who represents an Ohio district, sought unsuccessfully to involve the U.S. Department of Justice (1, 2). Ohio Secretary of State reports: "Preparing for Success in 2008" (Oct. 2008) and "Ohio General Election Report." Lawrence Norden with Jessie Allen. April 8, 2009. "Final Report 2008-2009 Ohio Election Summit and Conference." Brennan Center for Justice at NYU School of Law. Harold Meyerson. "Changing the Ground Wars." The American Prospect, Oct. 31, 2008. Of the voting eligible population of 8,541,239, 5,708,350 (66.7%) voted in the presidential race; this is very close to the 66.8% VEP highest office turnout rate in 2004. Over 1.7 million votes or about 30% were cast early/absentee, including over 214,000 voters who voted in person by absentee from Sept. 30-Oct. 24. The Republican ticket carried 66 counties to 22 for the Democrats. In addition to Obama-Biden winning the state by 4.59 percentage points, the tide helped Democrats gain three U.S. House seats (1st-Cincinnati, 15th-Columbus and 16th-NE Ohio, Canton), and gain a majority in the state House. 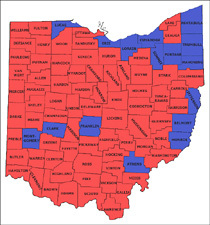 Obama's five strongest counties percentagewise were Cuyahoga (68.90%), Athens (66.63%), Lucas (64.98%), Mahoning (62.24%) and Trumbull (60.00%). McCain obtained 60 percent or more of the vote in 22 counties; his five strongest counties percentagewise were Mercer (70.99%), Putnam (69.98%) and Auglaize (69.80%), all in the Northwest, as well as Holmes (69.47%) and Warren (67.50%). The five largest counties accounted for 38.78% of the vote for president in 2000 and 38.77% in 2004 and 38.66% in 2008. Obama carried all five of these counties. His 258,542-vote plurality in Cuyahoga County almost equalled his statewide plurality of 262,224 votes.